38 items found for "Show all items"
The Czech Republic took over the chairmanship of the Committee of Ministers of the Council of Europe on 19 May. Among the nine designated priorities of the 6 month chairmanship is the promotion of human rights education and linguistic skills. The new CEFR website www.coe.int/lang-CECR offers a large range of different resources, contributed by major European institutions and developed in different research projects and investigations. The innovative and ambitious website developed by the Language Policy Programme (Education Policy Division, Strasbourg) will continue to evolve with other key resources to be added, in particular a new CEFR Companion Volume. Available today in 40 languages – including non-European ones – the CEFR has enjoyed an increasing success and is now used in a significant number of countries on several continents. The implementation of the CEFR has also benefitted from development projects and training opportunities offered by the European Centre for Modern Languages. Get ready for the European Day of Languages! With just over two months to go until the 2017 European Day of Languages, preparations are well underway for hundreds of activities around the continent celebrating Europe’s rich mosaic of languages and cultures. Whether you are interested in learning a new language, taking part in competitions and quizzes, discovering methodologies behind language learning or simply enjoying music, dance, theatre and story-telling from different cultures, there is almost certainly a corresponding EDL event close to you on or around 26 September. You can find a plethora of creative ideas, interesting facts, materials to download, games, activities on the dedicated European Day of Languages website. The site is now available in 36 languages and contains resources for teachers, students and in fact anyone with an interest in languages. We a very much welcome suggestions regarding ‘language trivia’, unique words, amusing idioms, palindromes and the longest words in the languages you know. If you are planning an event, – we are also delighted to promote your activity. •	a directory of language (teacher) associations in Europe (currently containing over 350 associations). Successful adaptation and use of the ECML Plurimobil mobility kit in Liechtenstein. The Erasmus+ project entitled "Language Stay 2.0 - Supporting qualitative and sustainable language courses abroad (Li-Lingua)", carried out by the Office of Education of the Principality of Liechtenstein (Schulamt des Fürstentums Liechtenstein) with the involvement of the European Centre for Modern Languages (ECML) of the Council of Europe, has been successfully completed. The aim was to make a significant contribution to the promotion of the international dimension in school education in Liechtenstein by promoting sustainable and more efficient learning in language stays of pupils. The ECML was represented as a partner in the initiative by Mirjam Egli-Cuenat and Katharina Höchle-Maier who accompanied and supported the exchange programme. Following its completion the initiative was noted as a model of good practice by the external evaluator. Matilde Grünhage Monetti, coordinator of Language for Work (LfW) (http://languageforwork.ecml.at was invited to participate in a multiplier event for the COMBI project in Donostia, in the Basque region of Spain, on 6th and 7th June. The project "Communication competences for migrants and disadvantaged background learners in bilingual work environments" is co-funded by the Erasmus+ Programme of the European Union. COMBI partners are acting in various officially bilingual regions in Europe. 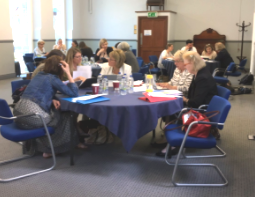 Participate in the online survey "Promoting excellence in sign language instruction"
Stakeholders in curriculum design, curriculum implementation, quality assurance, assessment and training for the new specification attended a RELANG workshop in Dublin from 24-26 May. 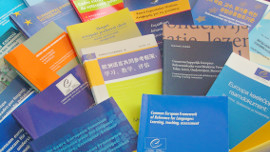 The RELANG initiative offers training to stakeholders in the Member States of the European Union and the European Centre for Modern Languages (ECML) in relating language tests and examinations to the Common European Framework of Reference for Languages (CEFR) in a valid way and exploring relationships between foreign language curricula and the CEFR. The article describes how the CEFR relates to the new Junior Cycle MFL specification. A recording of the seminar involving Sarah Breslin, Executive Director of the ECML, and Terry Lamb, Co-coordinator of the ECML-EC Training and consultancy activity “Supporting multilingual classrooms”, is now available on YouTube. The aim of the PARENTS website is to disseminate knowledge on the benefits of involving parents in plurilingual and intercultural education. A number of activities provide parents and teachers with tools that will help them to work together in plurilingual and intercultural education. Video testimonies of a head teacher and an educator; short documentary describing the activities of the Zonarelli intercultural centre in Bologna; and the contribution of a mother. The inventory of freely available online tools and open educational resources for language teaching and learning has been developed by the ICT-REV project of the ECML for language teachers, teacher trainers, language policy makers and multipliers. It currently contains 92 tools that have been evaluated with specific criteria in mind. eTwinning: online platform for staff working in schools in different European countries for collaborating, communicating and building projects together, such as international school partnerships. Flubaroo: tool converting quiz answers into grades; designed for helping teachers to grade and to provide feedback to multiple-choice and fill-in-the-blank type assignments. Google Earth: with your students you can visit any place in the world without leaving the classroom. ipadio: mobile app which allows teachers to make broadcasts through phone calls and then add titles, images etc. to the recording if they wish. Ambrosio, Laura, FREPA descriptors and their role and contribution to integration of students from mixed linguistic backgrounds in a multilingual world, ALTE 6th International Conference “Assessment in a multilingual world”, 5-7 May 2017, Bologna, Italy. Presentation. The Austrian Language Competence Centre (ÖSZ), national contact point for the ECML in Austria, has been interviewed on the event “Sprachen-im-Blick” on 28 June. The interview has been commissioned by the Austrian Federal Ministry of Education in cooperation with the teacher training college of Salzburg (Stefan Zweig), and livestreamed on the radio station Agora (Carinthia) on 6 July (2-3 p.m.). (Re)Listen to the interview on the website of the ÖSZ (in German). "Sprache und Fachunterricht: Konzepte und Ansätze im Vergleich" (Languages and the teaching of subjects: comparison of concepts and approaches), hosted by the ECML, Graz on 6-7 October 2017, Seminar of the Pedagogical University of Styria and the Austrian Language Competence Centre commissioned by the Federal Ministry of Education, in cooperation with the Federal Centre for Intercultural Affairs, Migration and Multilingualism and with the support of the Council of Europe's Centre for Modern Languages and the Association of the European Centre for Modern Languages in Graz. Symposium ‘Immersion in higher education: Where do we stand today?’ (University of Ottawa, 11-12 May 2017) The event hosted by the Post-Secondary Immersion Research Group (PSIRG) of the Official Languages and Bilingualism Institute (OLBI) was an extraordinary occasion for researchers, teachers, students, administrators and all others with an interest in the development of immersion in higher education to gather and share experiences, knowledge, and ideas. The programme featured distinguished speakers from Europe and North America who brought to the table unique perspectives and stimulated dialogue on challenges and achievements in the areas of bilingualism, linguistic models and immersion. • Nina Pilke (Vaasa Universitet): Immersion in Higher Education in Finland: Blind Men Appraising an Elephant in the Room? Follow OLBI's news on Twitter! OLBI has a new Twitter account. Follow them and do not hesitate to tag them on your tweets (@ILOB_OLBI)! France: Latest newsletters from CIEP – Results of the calls for projects on "Languages and digital technology" and "Cultural action – French language"
Courriel européen des langues, no. 38, May 217: this issue is dedicated to the promotion of ECML projects and the dissemination of ECML tools in France, the latest developments of European institutions and a selection of new resources In the field of language education. Special issue/June 2017: "Les 10 ans du label Qualité français langue étrangère"
This new edition invites to develop digital and innovative tools that facilitate the development, use and mastery of the French language and the languages of France. 25 projects were selected among the 60 ones received. The call for projects launched by the French Ministry of Culture was a great success and resulted in the submission of about 600 projects. The 160 selected projects will allow to improve the access to the French language for a large number of people through artistic and cultural activities. The projects are intended to support the creation and dissemination of tools for stakeholders in the areas of culture, inclusion, training, justice, and in the social and socio-educational fields; and to encourage associations and cultural institutions to develop actions linking the learning of French language and the artistic practice for the benefit of people experiencing difficulties with the French language. From August 2017, LINGO will be the new CLIL platform for young learners in Germany (age groups: 6-12 and 13-16) in the MINT disciplines (mathematics, computer science, natural sciences and engineering). The multimedial offer is designed to support the learning and teaching of German as a foreign language or German as a second language for children and young people at A1 level. The interactive website offers many new contents, an app, a quiz duel, exciting MINT topics and experiments, interactive exercises, a magazine for children on MINT topics, reading and listening texts, etc. LINGO is supported by the educational publishing house and agency Eduversum Bildungsverlag and agency, the Department of Foreign Affairs of the Federal Republic of Germany and the Goethe Institute as co-editors. The Hellenic Open University launches a new postgraduate programme of studies on language education for refugees and migrants. Research Council of Norway: Evaluation of the humanities in Norway - Report from the Principal Evaluation Committee, June 2017. Organised as the 6th biennial conference on “Languages in Contact”. Abstracts should be up to 300 words and written in the same language as the presentation and in English. Deadline for proposals: 15th July 2017. Four possible thematic areas for the papers: Language and culture within cultural studies; Language, culture and tourism; Culture, plurilinguism and language learning; Language, culture and literature. The ECML is pleased to welcome Ms Sabine Gadeberg Larsen, Danish Ministry of Education, National Agency for Education and Quality, as the ECML Governing Board member. The ECML would like to express its deepest gratitude to Ms Pernille Skou Brønner Andersen for her continuous support and wholehearted involvement in this role during the last years. The conference (Strasbourg, 20-22 June 2017) addressed the promotion of democracy and human rights through education. Around 300 representatives of governments, education institutions and civil society organisations discussed current challenges and opportunities, shared examples of good practices and lessons learnt, and proposed recommendations for future action, including specific criteria and mechanisms for evaluation of progress, in particular in the framework of the Council of Europe Charter on Citizenship and Human Rights Education. Last June, the European Roma Institute for Arts and Culture (ERIAC) was officially launched in Berlin at an event organised by the German Federal Foreign Office, the Alliance for the European Roma Institute for Arts and Culture, the Council of Europe and the Open Society Foundations. The new institute will focus on creating a space for under-represented Roma artists, performers and thinkers in the mainstream of European art and culture. Report by the Secretary General of the Council of Europe State of democracy, Human Rights and the Rule of Law: Populism - How strong are Europe's checks and balances?